Over the weekend I made time to switch over from my black purse to my bright cheery dotty one, which is so much better suited to the gorgeous spring/summer weather. 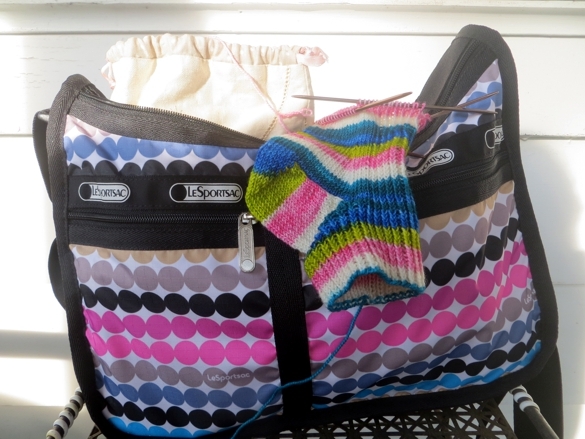 And yesterday, when I sat down on the subway and pulled out my knitting, I realized I had coordinated the purse with my sock. Last week I got together for coffee with a friend who'd just traveled for meetings overseas. I'm going to be honest here: I don't remember exactly which country he was in, though I think the city we were talking about might have been in China. What I do remember from our conversation is what he said about fashion. Apparently he'd been told in advance he'd find the people in one particular region remarkable and when he got there he found that indeed: the men were about a million times more fashion conscious than the women, which was saying something. Him: Well, they were carrying these bags. Messenger bags, sometimes smaller. Him: They matched them to their shoes. You know? Like our moms did. Me: [suddenly feeling very old and just a bit defensive because I still match my purse to my shoes when I do dress-up] Well, it's just leather. You get a good brown leather messenger bag, it's not like a lot of people don't wear brown leather shoes. Him: [pointing to my Tshirt, which is a perfect match for the green stripe in the sock pictured above] Your shirt, Mary. The bag and shoes would be like that shade of green. Him: Ah. All right then. Yes, more fashion forward than here. Anyway, now every time I go past a mens' store I'm looking at messenger bag colours to see whether that trend crosses over to Toronto. Because wouldn't one of those bags be awesome with my socks? but so far: just brown. Writing day today, mostly. Wish me luck and I hope you have a wonderful day doing whatever pops up on your own agenda!